Would you like to enjoy the soothing sounds of the L.A. Philharmonic in the grand setting of the Hollywood Bowl for FREE? This summer the Hollywood Bowl invites folks to sit in on the L.A. Philharmonic’s open rehearsals for FREE without having to pay the price of a ticket. This is a great opportunity to hear some amazing classical, baroque, and opera music. According to the Hollywood Patch, open rehearsals typically run on Tuesdays and Thursdays from 9:30 am – 12:30 pm and some Fridays from 10 am – noon. However, they are subject to change! So for your best bet to catch a LA Phil rehearsal is to call ahead of time and make sure that they are allowing guests in on that particular day. Another added bonus of taking in an open rehearsal? Families are permitted to bring a picnic lunch along as they watch and listen to the classical sounds. So take a look at the L.A. Phil schedule and if your calendar is flexible, it’s the perfect way to enjoy summer at the Bowl for FREE! Parking is also free. 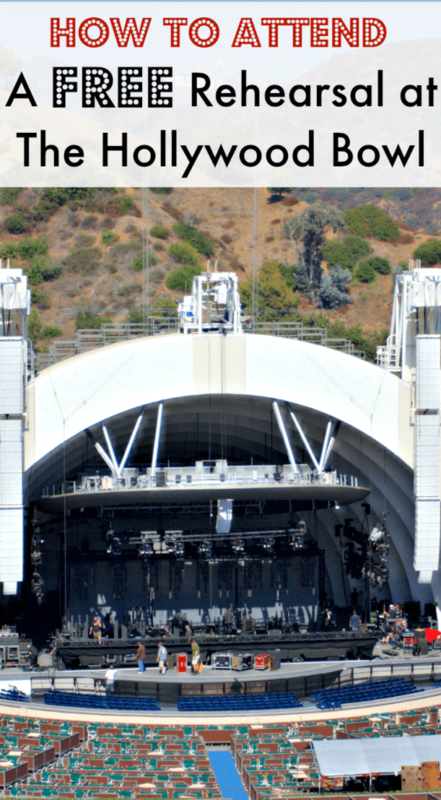 The Hollywood Bowl is located at 2301 N. Highland Avenue, Los Angeles, CA 90068. I’m interested in free rehearsals please. Ellen, if you check their rehearsal calendar you will find them listed. Please help me understand how to find their rehearsal schedule? I can’t seem to find it! Please help me understand how to find their rehearsal schedule? I can’t seem to find it! There seems to be no calendar for that, just performances. Scroll through this link. There is a # to call and check.